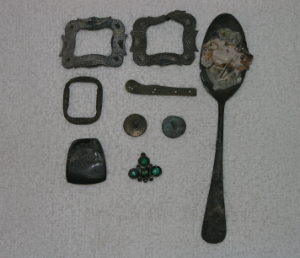 These items were found by Mr. French on various expeditions. Recovered from Poker Cay in the Bahamas this carving is of unknown origin. This cross was recovered from the Spanish Galleon "Nuestra Senora de los Milagros" which sank in the year 1741 off the coast of Yucatan, Mexico. 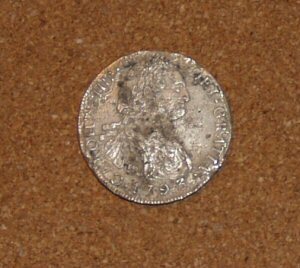 Silver Reale 8 coin found on a Caribbean sunken wreck site. 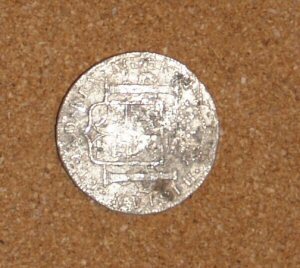 The coin minted in Mexico shows the date 1793 with King Charles IV and the coat of arms. Mayan carvings recovered from an expedition exploring Cenotes in Yucatan. 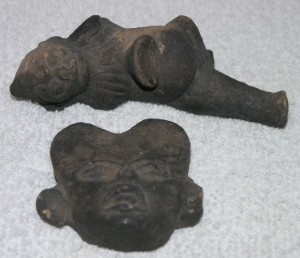 Artifacts from the 1741 Spanish shipwreck 'Montanceros' off the coast of Mexico.